The Sixth and Seventh Books of Moses is an 18th- or 19th-century magical text allegedly written by Moses, and passed down as hidden (or lost) books of the Five Books of Moses or Pentateuch. 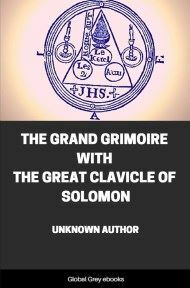 A grimoire, a text of magical incantations and seals, it purports to instruct the reader in the spells used to create the miracles portrayed in the Judaeo-Christian Bible. 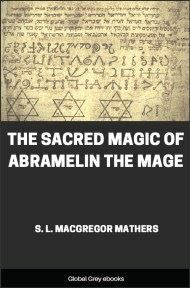 The work was printed with annexes or reputed Talmudic magic names, words and incantation, many taken from Christian biblical passages. It shows diagrams of "Seals": magical drawings accompanied by incantations intended to perform various tasks, from controlling weather or people to contacting the dead or Christian religious figures. 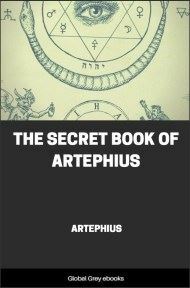 That is, that which embraces the whole of the White and Black Art, (Black Magic,) or the Necromancy of all Ministering Angels and Spirits; how to cite and desire the nine Choruses of the good angels and spirits, Saturn, Jupiter, Mars, Sun, Venus, Mercury, and Moon. The most serviceable angels are SALATHEEL, MICHAEL, RAPHAEL, URIEL, together with the Necromancy of the black magic of the best Ministering Spirits in the Chymia et Alchymia of Moses and Aaron. 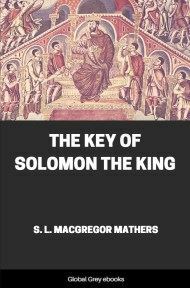 That which was hidden from David, the father of Solomon, by the High Priest SADOCK, as the highest mystery, but which was finally found in the year 330 A.D., among others, by the first Christian Emperor Constantine the Great, and sent to Pope Sylvester at Rome, after its translation under Julius II, Pontifice Maximus. Typis Manabilis sub poena excommunicationis de numquam public imprimendis sent to the Emperor Charles V., and highly recommended in the year 1520 A.D., approved by Julii II, duos libros quos Mosis condidit arter artistis summus sedalitate SADOCK. Libri hi colorum sacra sunt vota sequenter spiritus omnipotens qui uigil illa facit at est sumis pia necessaria. Fides. Instruction. These two Books were revealed by God, the Almighty, to his faithful servant Moses, on Mount Sinai, intervale lucis, and in this manner they also came into the hands of Aaron, Caleb, Joshua, and finally to David and his son Solomon and their high priest Sadock. Therefore, they are Biblis arcanum arcanorum, which means, Mystery of all Mysteries. The Conversation of God. Adonai, E El, Zeboath, Jebaouha, Jehovah, E El, Chad, Tetragramaton Chaddai, Channaniah, al Elyon, Chaye, Ayscher, Adoyah Zawah, Tetragramaton, Awiel, Adoyah, Chay, Yechal, Kanus, Emmet. Thus spake the Lord of Hosts to me Moses. Eheye, Ayscher, Jehel, Yazliah, Ellion. Sum qui sum ab aeterno in aeternum, thou my servant Moses, open thou thine ears, hear the voice of thy God. Through me Jehovah, Aglai, the God of heven and earth, thy race shall be multiplied and shall shine as the stars of heaven. In addition to this I will also give thee might, power and wisdom, to rule over the spirits of heaven and hell. Over the ministering angels and spirits of the fourth element as well as of the seven planets. Hear also the voice of thy God wherewith I give thee the seven seals and twelve tables. Schem, Schel, Hamforach, that the angels and spirits may always yield obedient service to thee, when thou callest upon them and citest them by these seven seals and twelve tables of my omnioptence; and hereunto thou shalt also have herewith a knowledge of the highest mysteries. Therefore, thou, my faithful friend, dear Moses, take thou the power and high might of thy God. Aclon, Ysheye, Channanyah, Yeschayah, E El, Elijon, Rachmiel, Ariel, Eheye, Ayscher, Eheye, Elyon. Through my Seals and Tables. I, N.N., a servant of God, desire, call upon the OCH, and conjure thee through water, fire, air, and earth, and everything that lives and moves therein, and by the most holy names of God, Agios, Tehirios, Perailtus, Alpha et Omega, Beginning and End, God and Man-Sabaoth, Adanai, Agla, Tetragramaton, Emanuel, Abua, Ceus, Elioa, Torna, Deus Salvator, Aramma, Messias, Clerob, Michael, Abreil, Achleof, Gachenas et Peraim, Eei Patris et Peraim Eei filii, et Peraim Dei spiritus Teti, and the words by which Solomon and Manasses, Cripinus and Agrippa conjured the spirits, and by whatever else thou mayest be conquered, that you will yield obedience to me, N.N. the same as Isaac did to Abraham, and appear before me, N.N. this instant, in the beautiful, mild, human form of a youth, and bring what I desire. (This the conjuror must name).